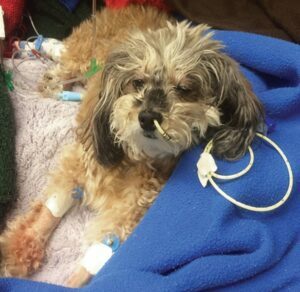 Fluid therapy is a mainstay of care in the hospitalized small animal patient. Assessment of a patient’s fluid deficits and ongoing needs will help determine what variety of fluid and rate to use. Fluid therapy is an essential component of the treatment plan in many hospitalized small animal patients. Choice of fluid type and dose depends on available resources as well as the patient’s interstitial hydration status, hemodynamic stability, and electrolyte balance. This article reviews fluid distribution, hydration assessment, types of body fluid losses, types of fluids available, and calculation of fluid needs. A second article will focus on calculating free water deficit, monitoring fluid therapy, when to discontinue fluids, and the approach to fluid therapy in patients with electrolyte abnormalities and specific fluid balance states. Total body water (TBW) is commonly described in terms of individual fluid compartments. Although fluid balance in the body is a dynamic process—water is constantly being lost through elimination and metabolic processes and gained from food and water intake—it is useful to use compartments to understand how water is distributed in the body and thus how fluid therapy affects overall hydration. TBW makes up approximately 60% of total body weight in adults (FIGURE 1) and 80% in pediatric animals.1 This percentage is lower in overweight patients because fat contains less water than other body tissues.1 Intracellular fluid accounts for two-thirds of TBW.1 Of the remaining third, approximately 75% is in the interstitial space and 25% is in the intravascular space1; a small amount is contained in the transcellular space (eg, cerebrospinal fluid, synovial fluid). FIGURE 1. Distribution of body water within the various compartments. 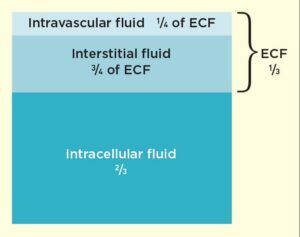 ECF, extracellular fluid. Fluid loss in small animals can be isotonic, hypotonic, or hypertonic. While osmolality is a measure of all solutes in solution, tonicity refers only to the effective solutes in solution; that is, those that cannot cross a membrane and so exert an osmotic pressure. Isotonic losses, such as those observed with vomiting and diarrhea, occur when the fluid being lost has an osmolality similar to that of plasma. With isotonic fluid loss, sodium concentrations are typically normal; however, if the animal is able to drink water, hyponatremia may result from replacement with a hypotonic fluid. Hypotonic losses occur when the type of fluid being lost has a higher concentration of water than plasma, such as with diabetes insipidus and panting. The loss of a hypotonic fluid, or water in excess of sodium, can result in hypernatremia. Although isotonic replacement fluids may benefit some patients with hypotonic losses, others benefit from fluids that contain more free water. Hypertonic losses, or loss of sodium in excess of water, are uncommon but can be seen with hypoadrenocorticism, third-space loss of fluid (such as pleural or peritoneal effusion), and diuretic administration.1 Excess loss of hypertonic fluid can result in hyponatremia. Treatment of hypernatremia and hyponatremia will be discussed in Fluid Therapy: Part 2. Dehydration refers to lack of fluid in the interstitial compartment, whereas hypovolemia describes lack of fluid in the intravascular compartment. Intracellular dehydration cannot be detected on physical examination and is primarily assessed via changes in sodium concentration. Data adapted from reference 5. FIGURE 3. 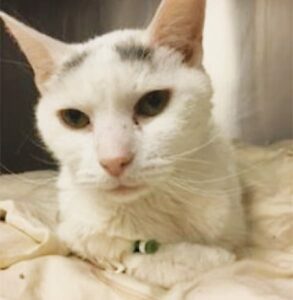 Dehydrated cat on IV fluids. Note the sunken eyes. Overhydration of the interstitial compartment, which occurs in cases of fluid overload, can also be detected on physical examination. Signs of overhydration include chemosis, serous nasal discharge, increased skin turgor, peripheral edema, ascites, pleural effusion, and pulmonary edema. Hydration status should be interpreted with the clinical status of the patient in mind. For example, hypersalivation in a nauseated patient may result in moist mucous membranes, but the patient may still have decreased skin turgor, indicating dehydration. Conversely, decreased skin turgor may be present in emaciated or older animals regardless of hydration status. In pediatric animals, skin turgor is often maintained because of increased skin elasticity, making this finding more difficult to interpret in this population. The 4 primary means of fluid delivery are intravenous (IV), intraosseous, subcutaneous (SC), and enteral. IV fluid administration is generally preferred for hospitalized patients because the delivery rate can be controlled and changed quickly depending on patient requirements. Intravascular volume can also be assessed on physical examination. Signs of decreased intravascular volume, or hypovolemia, include increased heart rate, fair or weak pulses, coolness of the distal limbs, weakness, and pale mucous membranes. Although blood pressure can initially be normal or even high in the early stages of hypovolemic shock, a normal blood pressure in conjunction with physical examination findings consistent with hypovolemia should not dissuade clinicians from considering hypovolemia and treating appropriately because compensated shock will eventually progress to the uncompensated stage. The 4 primary means of fluid delivery are intravenous (IV), intraosseous, subcutaneous (SC), and enteral. IV fluid administration is generally preferred for hospitalized patients because the delivery rate can be controlled and changed quickly depending on patient requirements. 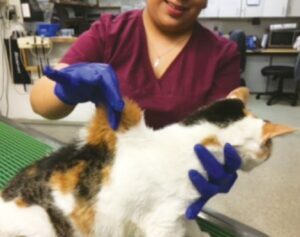 Intraosseous catheters can be placed in neonates, exotic patients, and other small animals in which IV access cannot be obtained, but these catheters may not be tolerated for extended periods once patients have been resuscitated. SC fluids are not recommended for hospitalized patients because they are more difficult to titrate. In addition, patients with intravascular deficits require more aggressive support; SC fluids are not adequately absorbed because of peripheral vasoconstriction and so are not indicated for treating shock. Patients that are easily overloaded may receive too much fluid with no means of discontinuation once fluids are administered, resulting in fluid overload. In patients that are being discharged from the hospital, SC fluids may become a component of home care if they are well tolerated and there are ongoing excessive fluid losses. Enteral fluids are ideal in patients that can tolerate them because enteral delivery is the most physiologic method to provide water. Many hospitalized patients cannot take in adequate water for various reasons (eg, vomiting, nausea, hypotension). If a patient can tolerate enteral water but is not willing to drink an adequate amount, a feeding tube can be used to provide fluids. An esophagostomy tube placed for feeding can also be used for water intake. Alternatively, a nasoesophageal tube can be placed to provide water and liquid diets (FIGURE 4). This is particularly useful in patients that cannot tolerate IV fluids, such as those with cardiac and/or renal disease. FIGURE 4. A mixed-breed dog with neurologic disease and a nasoesophageal tube placed to administer water. The dog was unable to drink on its own and had developed hypernatremia. The tube allows administration of free water to correct the hypernatremia. Crystalloids are fluids containing small solutes (<500 Da), most of which are electrolytes, in particular sodium and chloride.3 The electrolytes and water in these solutions move easily across the endothelium into the interstitial space. More than 60% to 80% of a crystalloid solution distributes out of the intravascular space within 20 to 30 minutes.3,4 Crystalloid solutions can be classified as isotonic, hypotonic, or hypertonic. Isotonic crystalloids have an osmolarity and sodium concentration similar to those of plasma. They are commonly used to treat interstitial dehydration and hypovolemia because fluid losses are typically isotonic or hypotonic. Isotonic solutions are considered balanced (or buffered) if their electrolyte composition and pH closely mirror those of plasma. Common balanced isotonic crystalloids include Plasmalyte-A (baxter.com), Normosol-R (hospira.com), and lactated Ringer’s solution (LRS) (TABLE 2). Metabolism of these buffers consumes hydrogen ions, resulting in an alkalinizing effect. The lactate in LRS is metabolized by the liver; thus, it is a suboptimal choice for patients with hepatic dysfunction or diabetic ketoacidosis because they will not be able to convert lactate to bicarbonate. Neonates are able to use lactate as a fuel source, making LRS the preferred fluid choice for young patients. Many available crystalloids are buffered solutions meant for fluid replacement (eg, Plasmalyte-A, Normosol-R). For longer-term treatment of patients receiving IV fluids, maintenance fluids (eg, Plasmalyte-56, Normosol-M) are solutions that contain lower sodium and higher potassium concentrations to meet maintenance needs. These solutions use dextrose to increase the osmolality of what would otherwise be a hyposmolar fluid. In practice, replacement fluids are frequently used as maintenance fluids and are often well tolerated in patients that do not have underlying conditions, such as cardiac or renal disease, that make them unable to handle the excess sodium. In contrast, 0.9% saline is an unbuffered isotonic crystalloid. Although the tonicity of 0.9% saline is similar to that of plasma, the pH is relatively low (5.5) and the solution contains no electrolytes other than sodium and chloride. Isotonic saline is the fluid of choice for treating hypochloremic metabolic alkalosis because the acid–base disturbance cannot be resolved without correction of chloride. It also promotes calciuresis and so can be used in the treatment of hypercalcemia. Hypotonic crystalloids are useful for treating patients with hypotonic fluid losses that result in hypernatremia or patients that have renal disease and cannot excrete the salt load of balanced isotonic solutions. Two commonly used hypotonic solutions are 0.45% saline and 5% dextrose in water (D5W). The former has an osmolarity of 154 mOsm/L, approximately half the normal plasma osmolarity in dogs and cats. D5W has a high osmolarity at 250 mOsm/L, but the dextrose in solution is rapidly metabolized upon infusion, resulting in infusion of what is essentially free water. Hypertonic saline is the primary hypertonic fluid administered in small animal medicine. Hypertonic saline from 3-7.5% is primarily used during resuscitation in hypovolemic shock and to decrease intracranial pressure. Administration of hypertonic saline results in free water shifting from the interstitial space into the intravascular space, expanding the extracellular volume by approximately 3 times the volume administered.3,6 Movement of fluid into the intravascular space results in interstitial and intracellular dehydration, so a hypertonic saline bolus should be followed by a bolus of isotonic crystalloid, although this is not necessary if used to treat cerebral edema. The intravascular expansion is short lived, lasting approximately 30 minutes before redistribution.3 Because the effect is transient, hypertonic saline can be combined with colloid solutions to prolong time present in the intravascular space. Signs of overhydration include chemosis, serous nasal discharge, increased skin turgor, peripheral edema, ascites, pleural effusion, and pulmonary edema. The use of HES has been under debate—the risk for acute kidney injury (AKI) and increased mortality in humans has resulted in a “black box” warning from the Food and Drug Administration.8,9 A retrospective study evaluating the occurrence of AKI and death in dogs receiving HES showed an increased risk for both; however, this study evaluated a 10% HES solution, which is thought to be associated with increased risk for AKI compared with 6% solutions.10 Other potential adverse effects of HES include coagulopathy, pruritus, reticuloendothelial dysfunction, proinflammatory effects, volume overload, hepatopathy, and anaphylaxis.2,4 The incidence of AKI and increased mortality in humans has been associated with longer infusion times and higher volumes than are used in most veterinary patients,4 and further research is needed in animal patient populations to determine the risk-to-benefit ratio. HES is still used in our institution, although with somewhat more caution than previously. Although the administration of an albumin solution would be preferable, species-specific albumin is expensive and is only intermittently available.1,4 Concentrated human serum albumin can be administered to dogs for the treatment of hypoalbuminemia, but because it is not completely homologous with canine albumin, there is potential for an immediate or delayed hypersensitivity reaction, which can result in death.1,4 Immediate hypersensitivity reactions are more common in healthy patients. Although immediate hypersensitivity reactions are rare in critically ill patients that receive human serum albumin, delayed hypersensitivity is observed as a serious complication in this population. When deciding if fluid therapy is appropriate for a patient, a few basic questions should be asked before determining a fluid therapy plan (BOX 1). These questions can be answered based on assessment of the patient for hypovolemia and dehydration (see Determining Fluid Deficits). Once the patient’s volume status and hydration needs have been determined, a fluid therapy plan can be developed. Is the patient hypovolemic? Does it need a bolus? What type of fluid should be given? How much fluid should be given, and over what time period? When can the fluids be discontinued? The goal of fluid therapy in patients with hypovolemic and distributive shock is to rapidly restore effective circulating volume and improve cellular oxygenation. Cardiogenic shock should be ruled out before the administration of crystalloid and colloid fluids because of the risk for exacerbation of pulmonary vasculature fluid overload. The “shock bolus” of fluids is based on the estimated blood volume of the patient: 60 to 90 mL/kg in dogs and 40 to 60 mL/kg in cats. This amount of fluid is typically not administered because most patients have not lost their entire blood volume and respond to lower volumes of fluids. In dogs, recommendations are to start by administering 10-20ml/kg boluses of isotonic crystalloids over 15 to 30 minutes and reassessing the patient’s intravascular volume status after each bolus. Subsequent boluses can be administered according to whether perfusion parameters (eg, heart rate, blood pressure, capillary refill time, mucous membrane color) are improved. Cats are typically less tolerant of fluid boluses than dogs, so slightly lower volumes (10 to 15 mL/kg) are recommended. If a synthetic colloid is used, 5 mL/kg in dogs and 3 mL/kg in cats should be administered over 15 to 30 minutes. Dehydration can be corrected over 24 to 48 hours. Once the deficit has been determined, the total volume can be divided by the number of hours over which the dehydration is to be corrected to obtain a mL/h rate. Maintenance fluid needs are based on both sensible and insensible losses. These can be estimated as 40-60 ml/kg per day or 2-3 ml/kg per hour in adults (pediatric patients require slightly higher rates). Ongoing losses include excessive urine output in polyuric animals, vomiting, diarrhea, blood loss, and third spacing. These losses vary by patient and may be difficult to calculate. A general rule is to estimate the amount of ongoing loss in a patient in mL/h and then reassess the patient in 4 to 6 hours to determine whether this amount needs to be adjusted. Rudloff E. Assessment of hydration. In: Silverstein D, Hopper K, eds. Small Animal Critical Care Medicine. 2nd ed. St. Louis. MO: Elsevier; 2015:302-311. Liu DT, Silverstein DC. Crystalloids, colloids, and hemoglobin-based oxygen carrying solutions. In: Silverstein D, Hopper L, eds. Small Animal Critical Care Medicine. 2nd ed. St. Louis, MO: Elsevier; 2015:311- 315. Cazolli D, Prittie J. The crystalloid-colloid debate: consequences of resuscitation fluid selection in veterinary critical care. J Vet Emerg Crit Care 2015;25(1):6-19. Muir WW, DiBartola SP. Fluid therapy. In: Kirk RW, ed. Current Veterinary Therapy VIII. Philadelphia: WB Saunders; 1983:33. Silverstein DC, Aldrich J, Haskins SC, et al. Assessment of changes in blood volume in response to resuscitative fluid administration in dogs. J Vet Emerg Crit Care 2005;15(3):185-192. Mathews KA. The various types of parenteral fluids and their indications. Vet Clin N Am 1998;28(3):483-513. Glover PA, Rudloff E, Kirby R. Hydroxyethyl starch: a review of pharmacokinetics, pharmacodynamics, current products, and potential clinical risks, benefits, and use. J Vet Emerg Crit Care 2014;24(6):642-661. Perel P, Roberts I, Ker K. Colloids versus crystalloids for fluid resuscitation in critically ill patients. Cochrane Database Syst Rev 2013;2:1-64. Hayes G, Benedecenti L, Mathews K. Retrospective cohort study on the incidence of acute kidney injury and death following hydroxyethyl starch (HES 10% 250/0.5/5:1) administration in dogs (2007-2010). J Vet Emerg Crit Care 2016;26(1):35-40. Lori S. Waddell, DVM, DACVECC, is clinical professor of critical care medicine at the University of Pennsylvania, working in the intensive care unit. She graduated from Cornell University’s College of Veterinary Medicine and completed an internship at Angell Memorial Animal Hospital in Boston, Massachusetts. After her internship, she briefly worked as an emergency clinician in private practice before completing a residency in emergency and critical care at the University of Pennsylvania’s Veterinary Hospital. Her current areas of interest include fluid therapy, acid– base disturbances, and coagulation in critically ill patients.